Five stellar high school biology teachers are about to embark on an unforgettable science adventure. In July, the winners of the Tropical Biology Scholarships 2009 are off to a two-week field study course at one of the world's most important scientific and educational institutions: the Organization for Tropical Studies (OTS) in Costa Rica. OTS conducts graduate and undergraduate education, facilitates research, participates in tropical forest conservation, and maintains three biological stations in Costa Rica where it conducts environmental education programs. § William Hodges, Holt High School, Holt, Mich.
§ Lisa Stefanucci, Northwestern High School, Albion, Pa.
§ Kelly Tripp, West Brunswick High School, Shallotte, N.C.
plants and animals in their native habitats; in addition, they will design and conduct open-ended field research projects. While in Costa Rica (when they have Internet access), scholarship winners will "tweet" about their adventures at www.twitter.com/MillerandLevine. "ecogeeks" who have created lively videos that infuse curriculum topics with new relevance for students. "Untamed Science"is like science-reality TV, says Levine. 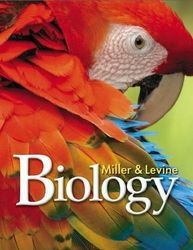 To learn more about "Untamed Science" and "Miller & Levine Biology" visit www.Biology.com.